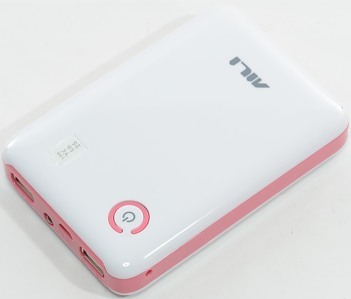 Dual- Usb output , one can Recognition Ipad /iphone/ipod, the other is universal for other phone. 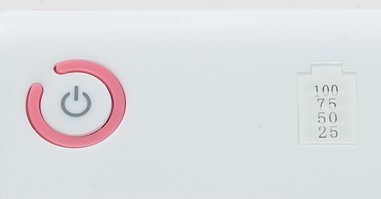 Reverse battery protection: if the battery is upside will automatically go into protection mode, corrected after a few minutes you can use . The box arrived in a envelope without any accessories. The box exist in different color combinations, I got the pink version. 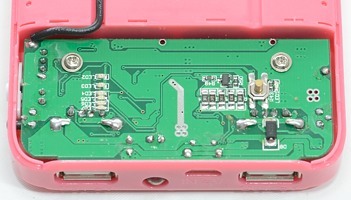 All connections are placed in the same end, micro usb for charging input and normal usb for output. These is also a led for flashlight usage. 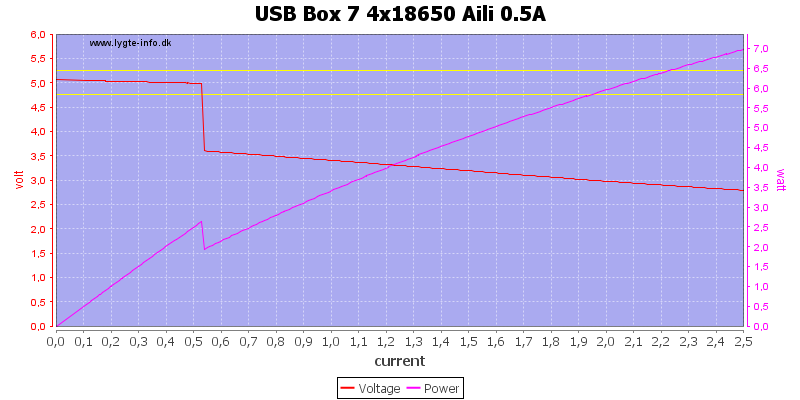 On one side is a current limit switch, it can select between 0.5A, 1A and 2A, but it does not change the coding of the usb connectors and the overcurrent protection is not very good. The black dot is a switch for the flashlight led. 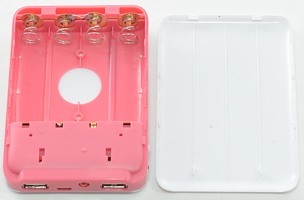 On the other side, in a hole, is the switch to reconnect the batteries. On the top of the box is the output switch with a red led in it and four green leds for power level indicators. 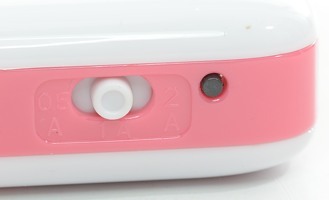 The red led behind the switch is on when output is on, the power level scale is on when the button is pressed. When charging a red led, behind the power level scale will light up. 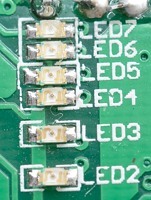 A closer look at the leds behind the power level indicators, as can be seen there are six leds. To replace the batteries, slide the bottom off the box. The batteries can be up to about 67 mm, but shorter is better, this means that only unprotected cells will fit. With a bit of violence it is possible to remove the top from the box. 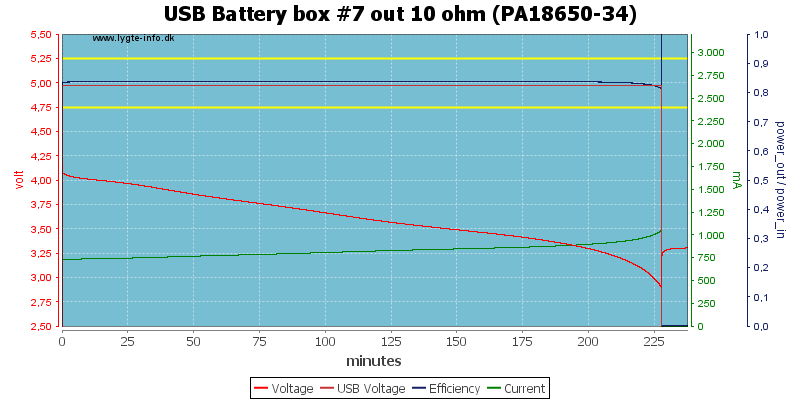 When battery is disabled the current draw is about 20uA to 45uA depending on voltage. 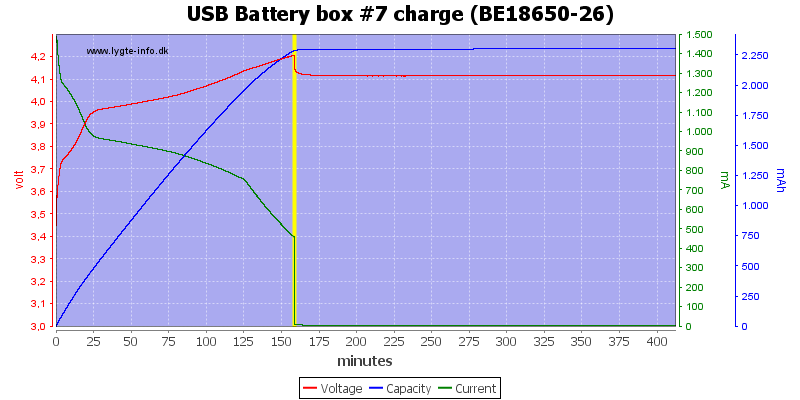 When battery is enabled, but output disabled the current draw is 5mA (Will drain 3100mAh batteries in 3 to 4 months). 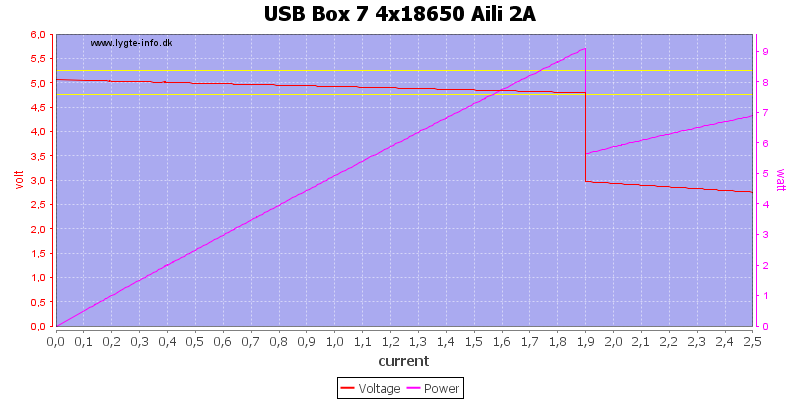 The USB outputs is coded as Apple 2.1A and USB charger only, i.e. if charging is slow or not working in one connector, try the other. Battery state on leds: below 3.40 volt 0 leds, between 3.40 and 3.56 volt 1 led, between 3.56 and 3.73 volt 2 led, between 3.73 and 3.93 volt 3 led, above 3.93 volt 4 leds. Led light uses up to 38mA, but will reduce current and brightness with falling battery voltage. 0.5A/1A/2A switch does not change standby current or the coding of the outputs. When charger is connected it will use input current to drive load and charge/discharge depending on load current. I did two load sweep, one with the switch at 0.5A and one with the switch at 2A, as can be seen the current limit is changed, but the box does not turns off when overloaded, only reduces voltage. 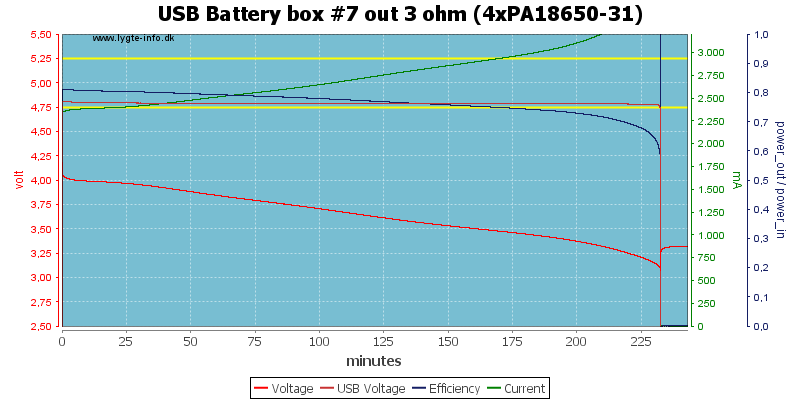 With a 1.67A load the box can keep the voltage up for nearly 4 hours. 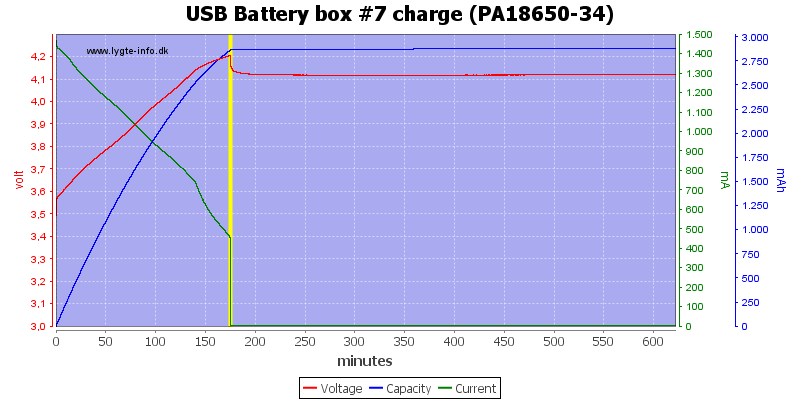 At this load it stops discharging the batteries at about 3.1 volt. Reducing the load to 0.5A, extends the runtime to more than 14 hours and the batteries are run down to just below 3 volt. 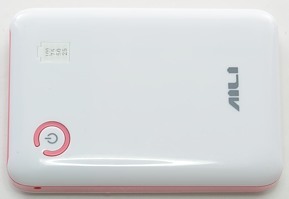 With 0.5A load and a single battery the runtime is about 3 hours and 45 minutes with a 3400mAh battery. 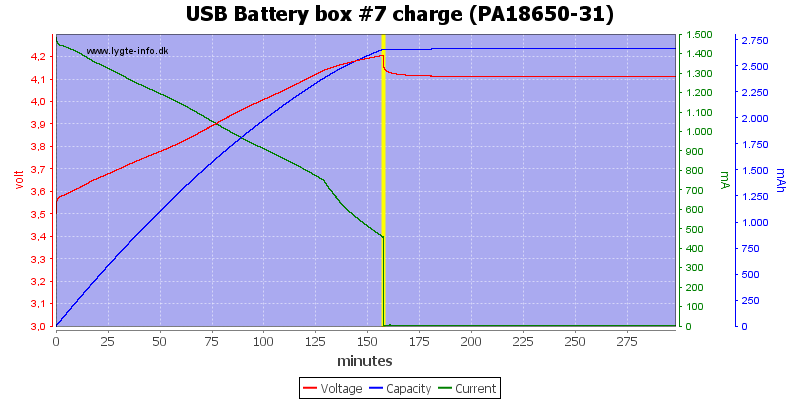 The charge profile is a steady declining current, this makes the charging slow, but is acceptable. 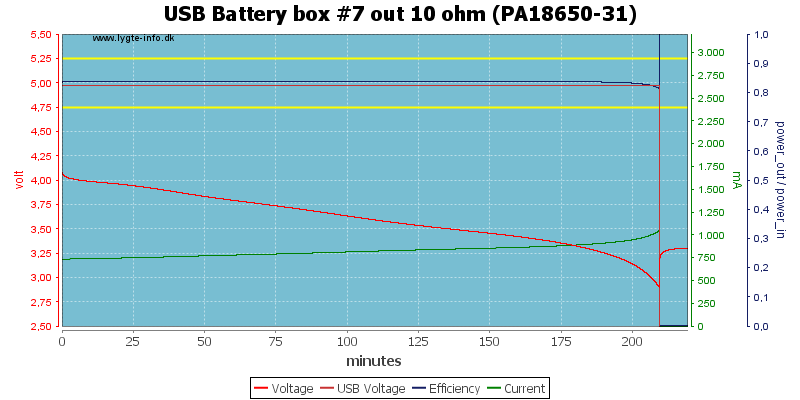 The "termination" is at 450mA, this is way too high for a single battery, as can be seen the voltage drops about 0.08 volt when the charge terminates. The charge does not terminate fully, but will continue to charge with a small current until the battery voltage is close to 4.2 volt. 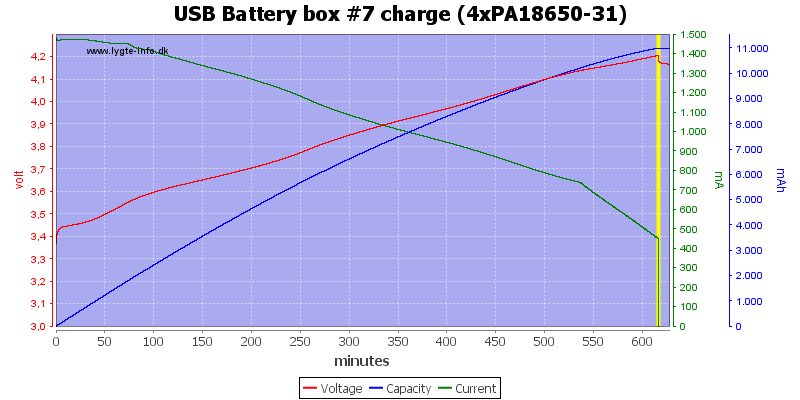 With four batteries it works better, here the voltage drop is less and the remaining charge current is much less due to higher voltage. The charge time is slightly above 10 hours. 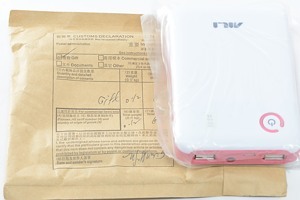 Due to the high standby draw, it is best to remove the batteries, when storing the box for more than a month. The charging is acceptable when the box has four batteries in it, but has to high termination current for one or two batteries, i.e. they are not fully charged. I do not really see the point in the current switch.